I was breezing by the World War II Memorial one rainy afternoon when I was drawn to the texture and rain drops on the base of this flag pole. Like many flag poles near the National Monuments, this one carries the names of the five branches of military service -- Army, Navy, Air Force, Marine Corps, and Coast Guard. Capturing the entire base of the flag pole felt boring, so I used a technique called breaking the frame. 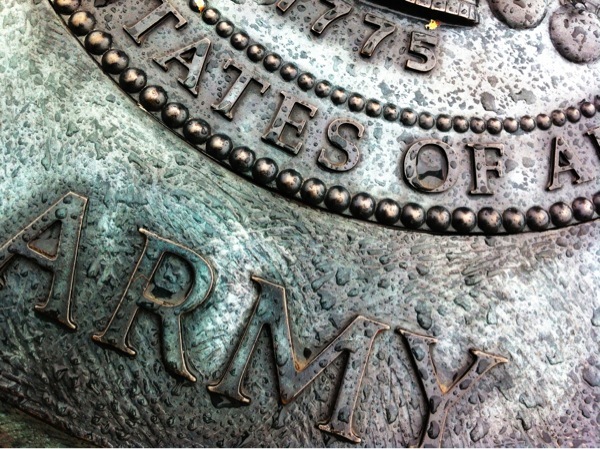 I didn't particularly care to show the names of all five Services; I wanted this photo to highlight the Army. Even so, there was no need to show the entire word "Army" for you to understand what it said. Breaking the frame means you get so close to your subject that part of it extends beyond the edge of your image. This technique is often used when a scene is very busy, and you need to simplify the number of objects in the photo. For instance, when you travel these days, it seems most destinations are swarming with tourists, and it is tough to get a shot that doesn't include clusters of people you don't know or care to remember. Cut the distracting clutter around your subject. Make your viewers feel so close, there is an intimate experience. Create a sense of intrigue as your viewers fill in the blanks with the missing part of the image. I clipped parts of the first and last letters of the word "Army," but I'm sure you immediately knew what it said. When I included the entire word, it didn't have the same artistic effect. Photograph a subject where you break the frame. Crop into the subject enough that we still recognize it, yet have to fill in some of the blanks mentally. See how it helps you simplify the scene and add an artistic element.